09/07/15 -- Soycomplex: Beans rallied sharply higher heading into tomorrow's USDA report. "Risk appetites returned to the macro markets with Chinese equities higher overnight. This spilled into Ags during the overnight session while short covering/positioning ahead of USDA reports tomorrow rallied markets further during the day session. Beans were the upside leader rallying back towards last week’s highs," said Benson Quinn. 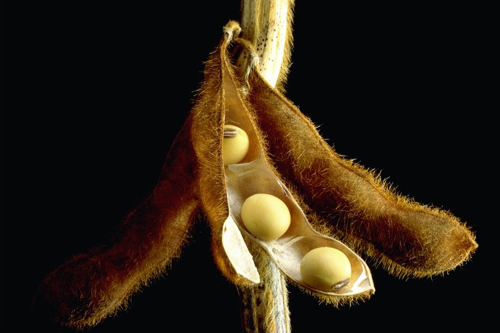 Soybean export sales came in at 41,400 MT on old crop and 201,100 MT for the new crop. Actual shipments this week were 202,200 MT, down 30 percent from the previous week. They don't need to be large though, the USDA has now already shipped 47.86 MMT of soybeans this season, with a further 2.69 MMT of outstanding sales waiting to go. That takes full season commitments to 50.55 MMT versus the USDA's current estimate for exports this season of "only" 49.26 MMT. So I guess we might see that increased tomorrow and old crop carryout dropped. The USDA had the latter at 330 million bushels in June. Trade estimates this time round average around the 287 million bushel region. Recall that earlier in the week it was noted that Oil World said that last year's US soybean production (said to have been 108 MMT) was probably overstated by around 2 MMT. Any changes to that would tighten old crop ending stocks further. We may also get a downwards revision on prospective 2015 US soybean yields and therefore production tomorrow. The USDA had yields at 46 bu/acre last month. A Bloomberg survey came up with an average trade guess of 45.1 bu/acre, from within a range of guesses of 43.5-46.0 bu/acre. Production was estimated at an average 3.781 billion bushels in that survey, with a range of guesses of 3.58-3.885 billion, down from the USDA's 3.85 billion a month ago. Global ending stocks are seen at an average of 91.89 MMT, from a range of 89.4-94.8 MMT and down from the USDA's June figure of 93.22 MMT. New crop US ending stocks are estimated at around 380 million bushels versus 475 million a month ago. The FAO today estimated the world 2015/16 soybean crop at 316 MMT, down 4 MMT from the current season's record, and around 1.5 MMT below the USDA's June forecast. MDA CropCast trimmed their US 2015 soybean production estimate to 3.694 billion bushels today. They also cut the global 2015/16 rapeseed crop to 65.21 MMT due to reductions in Canada. CONAB estimated the Brazilian 2014/15 soybean crop at 96.2 MMT, up 12% on a year previously and a new record high. The USDA were 94.5 MMT last month. Jul 15 Soybeans closed at $10.37 3/4, up 31 1/2 cents; Nov 15 Soybeans closed at $10.15 3/4, up 27 1/2 cents; Jul 15 Soybean Meal closed at $364.00, up $13.20; Jul 15 Soybean Oil closed at 32.27, up 67 points. 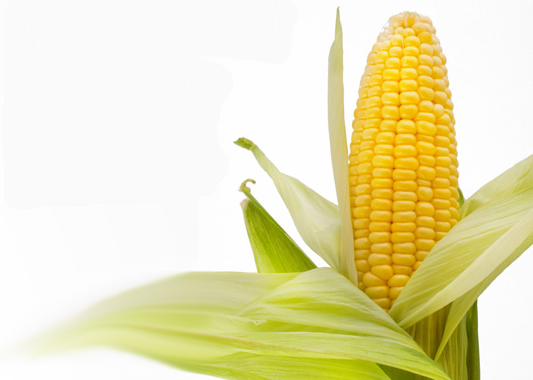 Corn: The corn market closed around 4-5 cents higher on positioning/short covering ahead of tomorrow's USDA report. The average trade guess in a Bloomberg survey came up with average 2015 US corn yields at 165.2 bu/acre, from within a range of 163.0-166.8 billion, the USDA's current 166.8 bu/acre and last year's record 171.0 bu/acre. Production was forecast at an average of 13.414 billion bushels, with the range of guesses coming in at 13.14-13.60 billion and versus 13.630 billion from the USDA a month ago. US 2014/15 ending stocks are seen at 1.549 billion bushels, with the range of guesses at 1.263-1.952 billion and the USDA's June forecast of 1.771 billion. World carryout this season is seen at an average of 192.31 MMT, with a range of estimates of 185.19-197.0 MMT and almost 3 MMT less than the USDA's June forecast of 195.19 MMT. Weekly export sales today came in at 535,200 MT for delivery in 2014/15 and 149,000 MT for 2015/16. The old crop sales included one cargo to China that was mostly switched from unknown destinations. Exports of 966,200 MT were down 6 percent from the previous week and 4 percent below the prior 4-week average. The primary destinations were Japan (208,200 MT), Mexico (141,800 MT), Peru (83,700 MT), Taiwan (76,100 MT), Egypt (71,400 MT), Saudi Arabia (70,800 MT), and South Korea (65,100 MT), the USDA said. The FAO raised their 2015/16 world corn crop estimate from 1002 MMT to 1007 MMT, still some 19 MMT down on the previous season's records crop. It is however well above the USDA who last month stood at 989 MMT. They also increased their view on 2015/16 global ending stocks, raising them from 219 MMT a month ago to 221 MMT this time round. MDA CropCast forecast a US 2015 corn crop of 13.525 billion bushels. 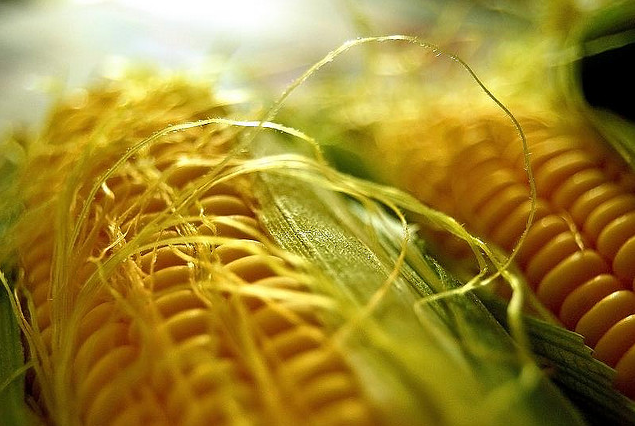 CONAB raised their forecast for total 2014/15 Brazilian corn production by 1.6 MMT to 81.81 MMT. Argentine and Brazilian markets were closed today for a holiday. Trading resumes tomorrow. FranceAgriMer raised their view on French corn exports in the 2014/15 season from 7.54 MMT to 7.67 MMT, a 46% increase on a year ago. Even so, carryout is still forecast nearly 45% higher at 3.31 MMT. Once tomorrow's USDA report is out of the way, the trade will be back to concentrating on the weather. "June rainfall has set a new record in Illinois corn with 8.88 inches. The long term average is 4.38 inches. Since May 1, the state’s rainfall has accumulated to 14.7 inches against 8.4 inches normally," said Martell Crop Projections. What does that mean for yields? They do say that rain makes grain after all. The closest similarly wet June was in 2010. "The Illinois corn yield in 2010 finished just slightly below trend following a similar wet June. Growing conditions gradually improved after flood waters abated. Moreover, July growing conditions were ideally cool, maximizing the yield potential during the critical pollination stage boosting the yield," they added. Jul 15 Corn closed at $4.21 1/4, up 5 cents; Dec 15 Corn closed at $4.39, up 4 3/4 cents. 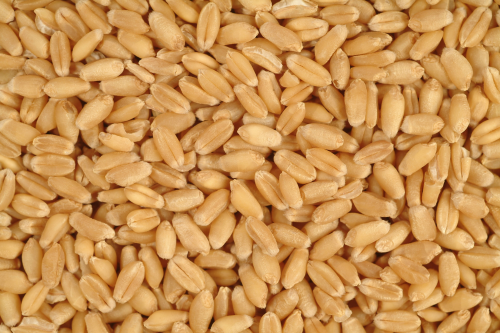 Wheat: The wheat market closed mostly lower ahead of tomorrow's report. Weekly export sales were in line with expectations at 345,900 MT, but once more didn't pull up any trees. Exports of 268,800 MT were also less that thrilling and were down 26 percent from the previous week. It's been 7 weeks since exports topped 400,000 MT, and 12 weeks since they were above 500,000 MT. That isn't the stuff of dreams. Unlike the corn and soybean markets, the trade is looking for the USDA to increase US production and stocks in tomorrow's WASDE report. That is expected to show a 2015 US all wheat crop of 2.145 billion bushels, with a range of estimates of 2.073-2.197 billion, and above the USDA's June estimate of 2.121 billion. US carryout is seen at 860 billion bushels, with a range of estimates of 695-947 million and up from the USDA's current 814 million forecast. On the global front, world 2015/16 carryout is seen at an average of 200.33 MMT, from within a range of 192.4-204.41 MMT and 202.40 MMT from the USDA a month ago. The FAO today estimated those at 198 MMT, down 3 MMT from a month ago, but in line with 2014/15. They see global production in 2015/16 at 723 MMT, unchanged from a month ago, down 8 MMT from the previous season's record, and around 1.5 MMT above last month's USDA offering. MDA CropCast trimmed their forecast for Canadian wheat production this year by 0.64 MMT on continued dryness. They now line up at 27.9 MMT, down 6.7% on a year ago. They also cut Argentina by 0.2 MMT to 11.3 MMT, an 11% drop compared with 2014/15. Russia said that they'd harvested 6.7 MMT of grains so far this season, down from 10.9 MMT at this point a year ago. The harvested area is also down at 1.8 million ha compared with 3.1 million this time a year ago. Average yields are however said to be up compared with 12 months ago at 3.77 MT/ha (3.54 MT/ha in 2014). Around 3.3% of the new crop Russian wheat area has been harvested, producing a crop of 3.3 MMT to date. Yields there are said to be averaging 3.74 MT/ha versus 3.59 MT/ha a year ago. FranceAgriMer raised their view on French soft wheat exports in 2014/15, up from 18.92 MMT to 19.31 MMT, and a small advance on shipments of 19.17 MMT the previous season. As with corn however, bumper production last year still means that carryover is higher year-on-year at 2.66 MMT compared with 2.35 MMT at the end of 2013/14. It will be interesting to see what the USDA say with regards to global wheat production tomorrow. "They have the ammunition to lower the global crop with reductions for Canada, some reduction for the EU. A reduction for India wouldn’t be out of the question. Making significant changes to Australia may be a bit premature," was Benson Quinn's opinion. The USDA are of course often famously slow to react to such things. Last month they had Canada at 29 MMT and Europe at 150.7 MMT. I'll go for 2 MMT off Canada and 1 MMT off Europe this time round. Jul 15 CBOT Wheat closed at $5.72 1/4, unchanged; Jul 15 KCBT Wheat closed at $5.65, down 5 3/4 cents; Jul 15 MGEX Wheat closed at $6.05 3/4, down 2 1/4 cents. 09/07/15 -- EU grains trade with mostly small gains. Yesterday's Chinese jitters have eased a little today, with the stock market there closing with some decent gains following the recent rout. At the close Nov 15 London wheat was up GBP0.50/tonne at GBP131.50/tonne, Sep 15 Paris wheat was EUR0.75/tonne higher at EUR196.75/tonne, Aug 15 Paris corn was down EUR0.50/tonne to EUR183.75/tonne, whilst Aug 15 Paris rapeseed was up EUR4.25/tonne to EUR388.75/tonne. US grain markets showed decent gains today, led by soybeans, supporting things across this side of the Atlantic - especially rapeseed. There's not a huge amount of fresh news about, at least nothing very startling, perhaps we will get that in tomorrow's WASDE report from the USDA? The FAO have released their latest offerings, predicting a 2015/16 world wheat crop unchanged from a month ago at 723 MMT, some 8 MMT below last year's record. Global ending stocks were lowered 3 MMT to 198 MMT, although that's still more than ample and matches carryout in 2014/15. They added 5 MMT to this year's global corn crop, taking that up to 1007 MMT, some 19 MMT below last year's record crop. That helped push ending stocks up 3 MMT to 221 MMT, a slight decrease on 224 MMT at the end of 2014/15. MDA CropCast made a 0.94 MMT downwards adjustment to their 2015/16 global wheat production estimate. The revision coming courtesy of a 0.64 MMT reduction in Canada and a 0.3 MMT decrease in Argentina. They predicted the world 2015/16 rapeseed crop at 65.21 MMT, slightly below Informa's recent 65.8 MMT. That was down 0.2 MMT on last week, entirely due to Canada. In Canada they said that "showers remain too light to significantly reduce dryness across the spring wheat belt, and only slight improvements are expected this week, mainly in northern and eastern belt areas. The majority of the growing areas in southwestern areas will remain quite dry, resulting in additional stress." Russia said that their 2015 harvest is now complete on 1.8 million ha (3.8% of plan), far less than the 3.1 million ha that had already been cut this time a year ago. That's produced a grain crop of 6.7 MMT so far versus 10.9 MMT this time last year. Average yields are said to be up 6.5% at 3.77 MT/ha. The Russian figures include 3.3 MMT of wheat off 3.3% of the planned area, for which yields are said to be up 4.2% on a year ago at 3.74 MT/ha. Barley yields are said to be doing even better. FranceAgriMer have tweaked their 2014/15 French balance sheet estimates, raising soft wheat exports from the 18.92 MMT forecast a month ago to 19.31 MMT, a small increase on 19.17 MMT in the previous season. Soft wheat ending stocks were revised down from 2.98 MMT to 2.66 MMT, although that's still 13.2% more than a year previously. Corn exports were raised a tad too, up from 7.54 MMT to 7.67 MMT, and ending stocks lowered slightly to 3.31 MMT, again though that's well up (+44.2%) compared to carryout at the end of 2013/14. French barley exports were little changed from the 6.65 MMT estimated a month ago, but ending stocks were raised from 962 TMT to 1.08 MMT, a 3.6% increase on a year previously. The Ukraine Ag Ministry said that they might revise down their estimate for a 2015 grain crop of 59-60 MMT if current high temperatures continue for another week. 08/07/15 -- Soycomplex: Beans reversed overnight losses to close with small gains, although ending around the middle of the day's trading range. Early weakness was linked to Chinese stock markets continuing their heavy fall, but beans managed to shrug off that negative influence later in the day. The trade is now looking to Friday's upcoming USDA report to provide some direction from the recent volatility that we have seen. Oil World said that last year's US soybean production was probably overstated by around 2 MMT. Based on last week's lower than expected stocks report there was “a strong indication that the official estimate of the 2014 US soybean crop of 108 MMT has been overestimated,” they said. The USDA have a chance to correct their figure on Friday. It will also be interesting to see if they make any changes to US soybean yield and production potential this year given the recent run of very wet weather. Dr Cordonnier today cut his US yield estimate by 1.5 bu/acre to 43.5 bu/acre. The USDA were at 46 bu/acre last month. A Bloomberg survey came up with an average trade guess of 45.1 bu/acre, from within a range of guesses of 43.5-46.0 bu/acre. Production was estimated at an average 3.781 billion bushels in that survey, with a range of guesses of 3.58-3.885 billion, down from the USDA's 3.85 billion a month ago. Dr Cordonnier is again the lowest estimate in the ring at 3.58 billion. If Oil World are right about last year's crop being overstated then reduced carry-in means that US 2015/16 soybean ending stocks, pegged at 475 million bushels by the USDA in June, are also likely to be smaller. The average trade guess for those this time round is 380 million bushels, although the range of estimates is pretty cavernous at 193-460 million. Global ending stocks are seen at an average of 91.89 MMT, from a range of 89.4-94.8 MMT and down from the USDA's June figure of 93.22 MMT. Informa cut 1.1 MMT off their world rapeseed production estimate, taking that down to 65.8 MMT, a fall of 8.2% on a year ago. Canada's crop was estimated at 14.2 MMT versus 15.1 MMT previously and 15.6 MMT a year ago. Private forecasters say that Canadian production could actually end up much lower than this. The USDA reported 240,000 MT of new crop soybean sales to unknown under the daily reporting system. Jul 15 Soybeans closed at $10.06 1/4, up 4 1/4 cents; Nov 15 Soybeans closed at $9.88 1/4, up 2 1/2 cents; Jul 15 Soybean Meal closed at $350.80, up $0.90; Jul 15 Soybean Oil closed at 31.60, up 19 points. Corn: The corn market closed with nominal gains of a cent or so, also recovering from lower overnight trade. The US Energy Dept reported weekly US ethanol production up 19,000 barrels/day on last week which was friendly. Stocks increased by 300,000 barrels to 19.8 million barrels. News on Reuters that Cargill are loading 50,000 MT of Brazilian corn bound for Wilmington in North Carolina, with others likely to follow, was not supportive however. Neither was the firm US dollar. Dr Cordonnier took 2 bu/acre off his 2015 US corn yield estimate, taking that down to 163 bu/acre. His 2015 US production estimate is 13.138 billion bushels versus the USDA's 13.630 billion and the 2014 crop of 14.216 billion. The average trade guess in a Bloomberg survey came up with yields at 165.2 bu/acre, from within a range of 163.0-166.8 billion, the USDA's current 166.8 bu/acre and last year's record 171.0 bu/acre. Production was forecast at an average of 13.414 billion bushels, with the range of guesses coming in at 13.14-13.60 billion. US 2014/15 ending stocks are seen at 1.549 billion bushels, with the range of guesses at 1.263-1.952 billion and the USDA's June forecast of 1.771 billion. World carryout this season is seen at an average of 192.31 MMT, with a range of estimates of 185.19-197.0 MMT and almost 3 MMT less than the USDA's June forecast of 195.19 MMT. Germany's DBV estimated corn production there this year to fall 7.2% to 4.77 MMT. 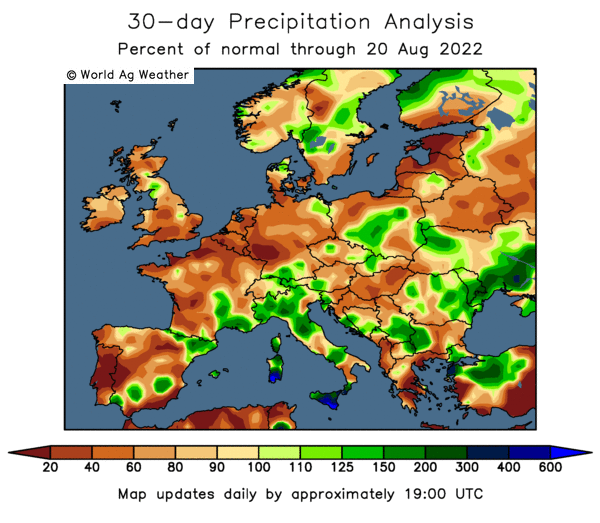 There's talk that the recent heat/dryness in Europe is taking potential corn yields down. US weather is forecast to continue to be cooler than normal through to Friday across the corn belt. Rainfall should be widespread from Kansas to the southeast half of the corn belt, with slightly lower coverage in other areas. Once we get past Friday, there should still be widespread rainfall from the northern plains and corn belt. Safras e Mercado increased their forecast for Brazil's 2014/15 corn crop from 82.3 MMT to 85.6 MMT, which is way above what the USDA are saying. The Argentine Ag Ministry said that farmers there are 59% sold on their 2014/15 corn crop, which is 11 points more than this time a year ago. Jul 15 Corn closed at $4.16 1/4, up 1/2 cent; Dec 15 Corn closed at $4.34 1/4, up 1 1/4 cents. Wheat: The wheat market closed lower, and much closer to the lows of the day than the highs, as "weak technicals, a strong dollar, and lack of global demand bears down on the complex," said Benson Quinn. There was some demand from Egypt's GASC, who were in the market for wheat, booking three cargoes, two of Russian origin and one of Ukraine origin, despite talk of Russian traders' disquiet over the new floating export duty on wheat. The price paid was reported at an average of $212.26/tonne C&F, slightly lower than the $212.47/tonne paid for Romanian wheat last week. US wheat was said to have offered at $260 FOB, and therefore stood no chance of competing. Friday's USDA report is expected to show a 2015 US all wheat crop of 2.145 billion bushels, with a range of estimates of 2.073-2.197 billion, and above the USDA's June estimate of 2.121 billion. US carryout is seen at 860 billion bushels, with a range of estimates of 695-947 million and up from the USDA's current 814 million forecast. World carryout is seen at an average of 200.33 MMT, from within a range of 192.4-204.41 MMT and 202.40 MMT from the USDA a month ago. The Argentine Ag Ministry said that growers there are 84% sold on their 2014/15 wheat crop versus 61% a year ago. Plantings for 2015/16 in Argentina are expected to be close to the lowest in the last 100 years, which may give US wheat a glimmer of opportunity to sell to Brazil in the second half of the season. Agritel cut 2 MMT off their EU soft wheat production estimate, taking that down to 138.5 MMT. ODA knocked 2.7 MMT off their forecast, revising that down to 137.3 MMT. Both cut their view on France to 37 MMT and 36.4 MMT respectively. Germany's DBV estimated the 2015 winter wheat crop there at 25.12 MMT, down 8.3% on a year ago. Winter barley production was forecast 10.3% down at 8.52 MMT, with the German spring barley crop seen 7.9% lower at 1.9 MMT. Tunisia tendered for 142,000 MT of soft wheat, 50,000 MT of durum and 50,000 MT of feed barley, all of optional origin. Reuters reported that the recent Algerian wheat purchase, originally said to have been for 500,000 MT, was in the end for 700-725,000 MT. The purchase was mostly French wheat, possibly including some German origin material, and mostly for September shipment, with maybe a bit of October. Jul 15 CBOT Wheat closed at $5.72 1/4, down 7 1/4 cents; Jul 15 KCBT Wheat closed at $5.68 1/4, down 2 1/2 cents; Jul 15 MGEX Wheat closed at $6.08, down 1 3/4 cents. 08/07/15 -- EU grains closed mostly lower under pressure from outside influences/harvest pressure. Talk of a possible Grexit/debt default and news that the Chinese stock market opened 8% lower, taking it down 30% in the past few weeks, is giving the market the jitters. At the close Nov 15 London wheat was down GBP1.750/tonne to GBP131.00/tonne, Sep 15 Paris wheat was EUR4.25/tonne easier at EUR196.00/tonne, Aug 15 Paris corn was down EUR2.75/tonne to EUR184.25/tonne, whilst Aug 15 Paris rapeseed was up EUR3.25/tonne to EUR384.50/tonne. Recent bullish market sentiment hasn’t detracted from the broader price trend yet, says the HGCA's Jack Watts. He notes that despite the recent price rise (until the last couple of days), the Nov 15 London wheat future hasn't yet broken out of the long-term downtrend that has been in place since the start of 2014. 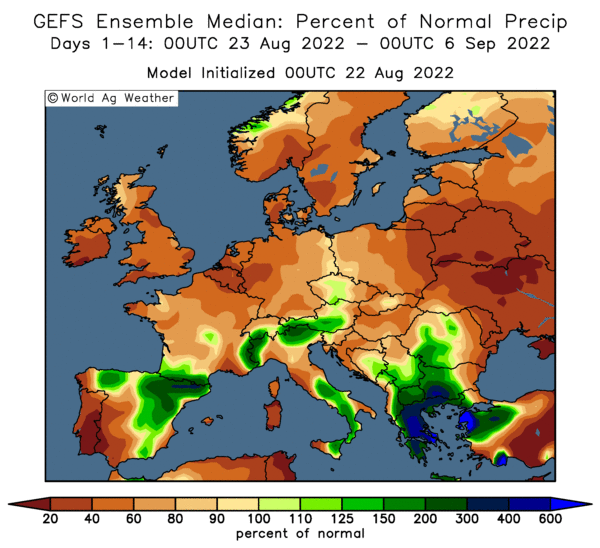 Hot and dry conditions in parts of Europe have raised concerns over crop yields. 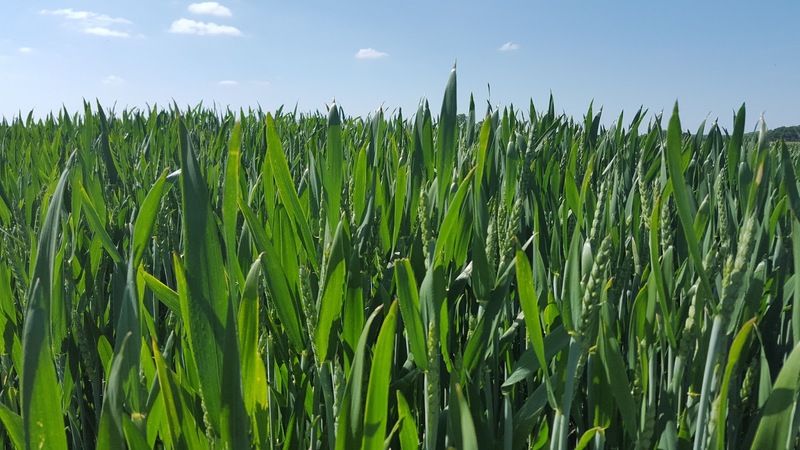 Put in perspective though, this spell of weather may have come too late to massively impact wheat, although corn and spring barley yields could still be at risk, he says. Nevertheless, EU wheat production estimates are being trimmed/pared back, if not exactly slashed. Agritel now estimate the EU-28 soft wheat crop at 138.5 MMT, some 2 MMT below their previous forecast and 7% below a year ago. ODA are even lower at 137.3 MMT, some 2.7 MMT below their previous estimate. They see production in France at 36.4 MMT versus 37 MMT from Agritel and compared to 37.87 from the French Ag Ministry just yesterday. Output was around 37.5 MMT a year ago. ODA also estimate the UK wheat crop at around 15 MMT versus 16.6 MMT a year ago, adding that output could fall below that level if dryness persists. Germany's DBV forecast this year's grain harvest there at 47.1 MMT, down 11% on last year, although they say that this is still in line with the 5-year average of 46.8 MMT. Production last year was exceptional of course. They have the German winter wheat crop 8.3% lower this year at 25.12 MMT, with winter barley down 10.3% at 8.52 MMT, spring barley down 7.9% at 1.9 MMT and corn production falling 7.2% to 4.77 MMT. They estimate the 2015 German winter rapeseed crop to tumble 20.5% to 4.96 MMT. Sticking with that crop, Strategie Grains today forecast the EU-28 rapeseed crop at 21.8 MMT, down 0.5 MMT from their previous estimate and 10.3% below 24.3 MMT a year ago. They see the French crop at 5.2 MMT versus 5.6 MMT previously and a million tonnes less than a year ago. The French Ministry were at 5.07 MMT for that yesterday. 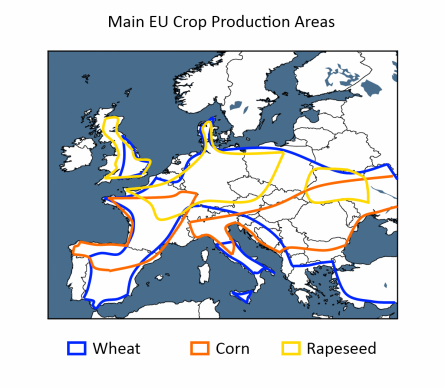 Bloomberg reported that French analysts Terres Inovia said that the recent heatwave and drought had had a 'major' impact on rapeseed yields in crops on light soils in the North and North Eastern regions of France. The harvest is progressing rapidly in the Rhone-Alpes, Auvergne and Burgundy regions, where first yields are very variable, from as little as 2 MT/ha to more than 4.5 MT/ha, they said. Strategie Grains estimate the UK 2015 rapeseed crop at 2.2 MMT, which is broadly in line with other trade forecasts. Egypt used this latest break as an opportunity to get back into the market, tendering for wheat for Aug 11-20 shipment. They finished up buying three cargoes, two of Russian origin and one from Ukraine. Algeria's recently reported 500 TMT of optional origin milling wheat purchase was probably in fact for 700-725 TMT, traders told Reuters. The bulk of that purchase will probably prove to be of French origin, although there could be some German wheat included to, they said. Algeria have also announced a tender for 100,000 MT of optional origin feed barley today. Tunisia are in the market for 142 TMT of soft wheat, 50 TMT of durum wheat and a similar volume of feed barley, all of optional origin. 07/07/15 -- Soycomplex: Beans closed the day sharply lower. The continued slump in the Chinese stock market is causing some concern, they are after all the country that accounts for around two thirds of all world soybean trade. Without them the global soybean market is massively oversupplied. The strong US dollar didn't help today either. The trade was also maybe a little surprised that the USDA left crop ratings unchanged in last night's report. The average guess in a Bloomberg survey was for a one point cut in good to excellent to 62%. There's plenty of competition around for US beans, in the face of record production in both Brazil and Argentina this year. Friday's upcoming WASDE report could see further South American production estimate increases from the USDA. Brazilian customs data shows that they exported a record 9.8 MMT of soybeans in June, up 5% from the May total, and in a shorter month as well. Dr Cordonnier says that the recent domestic soybean price rise will encourage an increase in plantings for the 2015/16 harvest of between 1-5%. Informa cut their forecast for the 2015/16 world soybean harvest from 319.1 MMT to 316.1 MMT, a 1.4% reduction on this season's record 320.5 MMT. They cut their view on this year's US crop from 105.9 MMT to 103.6 MMT, down 4.1% on last year. They see Brazil's crop at 97 MMT, down from 97.5 MMT previously, but still a record crop and up 1 MMT compared to this season. Argentina's crop was estimated unchanged from previously at 57 MMT, down 3.5 MMT from this year's record. That still keeps plenty of competition around for US beans in 2015/16. Jul 15 Soybeans closed at $10.02, down 31 3/4 cents; Nov 15 Soybeans closed at $9.85 3/4, down 29 cents; Jul 15 Soybean Meal closed at $349.90, down $4.50; Jul 15 Soybean Oil closed at 31.41, down 123 points. Corn: The corn market closed around 2-3 cents lower, doing its best to shrug off pressure from falling soybeans, wheat and outside markets. A slight improvement in US corn crop condition ratings last night probably caught a few off guard, the average consensus in a Bloomberg survey was for a one point drop in good to excellent ratings. Losses in the Chinese stock market are also a concern, but the US isn't really very reliant on them as an export home, unlike with soybeans. The USDA's FAS in China today increased the size of this year's corn crop there by 2 MMT to a new all time high 230 MMT, up a hefty 6.6% on 215.7 MMT a year ago. Corn imports in 2015/16 were estimated at only 3 MMT. Only a few years ago China's needs to import corn were being estimated 3-4 times higher than that, as this was seen as the next big growth market. That was a mistake it would now seem, sorghum is the new current "big thing" with China estimated to import 10 MMT of the grain this year. May sorghum imports alone topped 1 MMT. The fact that there's currently no import duty on sorghum, but that there is one on corn, makes sorghum around a $100/tonne cheaper imported grain than corn. That could change though, with the Chinese government keen to dispose of some of their burgeoning domestic corn stocks. Informa estimated the world corn crop in 2015/16 at 987.2 MMT, down a tad from a previous forecast of 987.9 MMT, and 1.2% down on a year ago. This year's US crop was trimmed from 344.2 MMT previously to 340.7 MMT, a 5.8% drop compared to last year's record. They see Chinese output a bit lower than the USDA's FAS at 228 MMT. Brazil's crop was raised 2 MMT to 78 MMT. The US weather forecast has cool conditions until Friday, then temperatures turn warmer. For the second half of the month, near to above normal temperatures and near to below normal rainfall is the current best guess, although of course there's plenty of time for that to change. Jul 15 Corn closed at $4.15 3/4, down 2 3/4 cents; Dec 15 Corn closed at $4.33, down 2 cents. Wheat: The wheat market closed lower. The dollar was strong, and the euro remains vulnerable on the possibility of a Grexit/Greek default. Neither are friendly for US wheat export ambitions going forward. There are areas of concern for wheat though. Whilst the US winter wheat harvest has almost caught up with the 5-year average pace, there's more rain in the forecast this week for the Southern Plains. Quality here is also an issue. 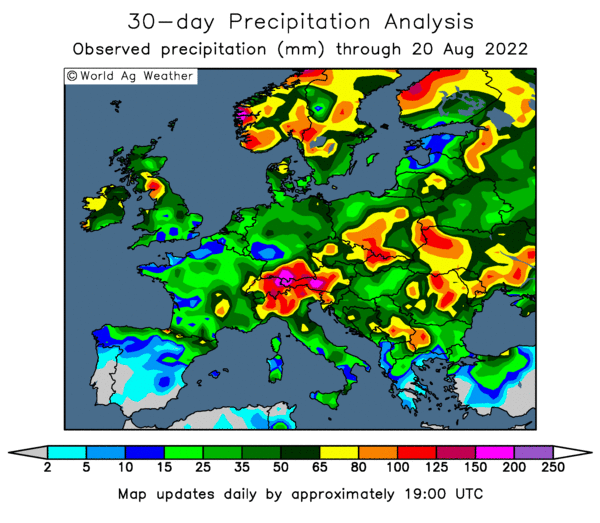 Potential wheat production estimates in Europe are getting trimmed, and there's widespread rumblings about crop losses in Canada, and a possible El Nino-reduced crop to come in eastern Australia too. Another area of concern is Argentina, where the Rosario Grain Exchange are adamant that plantings will fall to the second lowest in 100 years this year. Trade gossip says that Canada's wheat crop could fall to 25 MMT or less this year, reducing exports by 4-5 MMT. The USDA currently has the Canadian wheat crop at 29 MMT and exports only down 3 MMT compered to 2014/15. Informa today cut their world wheat crop estimate by 3.5 MMT to 715.2 MMT. Included in that was a 1.8 MMT reduction for Europe to 148.5 MMT. Russia's crop was however raised 1 MMT to 57 MMT, and the US all wheat crop increased by 0.5 MMT to 58.8 MMT. China's crop was estimated unchanged at 125 MMT, so too was India's at 88 MMT. The world 2015/16 barley crop was reduced by 0.5 MMT to 139.8 MMT, although Russia's potential was increased by 1 MMT to 17 MMT. The 2015 harvest in Russia and Ukraine is a bit behind due to rain. Russia has currently harvested 1.2 million ha versus 1.9 million a year ago, Ukraine is at 501.5k ha versus 2.34 million a year ago. Early yields are up in both country's though, with Russia up 3.2% at 3.87 MT/ha and Ukraine said to be up 10% at 3.2 MT/ha. All that comes with the caveat of if we believe what the respective Ag Ministry's in each country are telling us. Jul 15 CBOT Wheat closed at $5.79 1/2, down 9 cents; Jul 15 KCBT Wheat closed at $5.70 3/4, down 5 1/4 cents; Jul 15 MGEX Wheat closed at $6.09 3/4, down 9 cents. 07/07/15 -- EU grains closed lower across the board, with Jul London wheat down GBP1.65/tonne to GBP118.50/tonne, Sep 15 Paris wheat was EUR4.00/tonne lower at EUR200.25/tonne, Aug 15 Paris corn was down EUR4.50/tonne at EUR187.00/tonne, whilst Aug 15 Paris rapeseed tumbled EUR6.25/tonne lower to EUR381.25/tonne. The French Ag Ministry estimated the 2015 soft wheat harvest there at the second largest ever - 37.87 MMT. That's around 400 TMT up on a year ago, helped by increased plantings, even with estimated yields down from 7.48 MT/ha to 7.34 MT/ha. French durum wheat output this year was pegged at 1.72 MMT, taking the total French all wheat crop to 39.59 MMT. It would surely have topped 40 MMT without the recent heat and dryness taking the shine off yields. Informa cut their forecast for this year's EU-28 all wheat crop from 150.3 MMT to 148.5 MMT, a 4.6% decline on a year ago. They also pared back their estimate for this year's barley production in the EU from 58.7 MMT to 57.5 MMT, a 4.5% fall compared to 2014. Corn output in the Union was also trimmed, down from a previous 68.3 MMT to 68.1 MMT, a 7.6% drop versus last year. Russia and Ukraine's harvests are ongoing, but running behind last year's pace hampered by rain in some areas. Yields are up on last year though. In Russia they've so far cut 1.2 million ha versus 1.9 million ha a year ago. That's 2.5% of the planned area, producing a crop of 4.5 MMT to date (7.1 MMT a year ago), with average yields at 3.87 MT/ha, up from 3.75 MT/ha a year ago at this time. That total includes 517k ha of winter wheat, some 1.9% of the anticipated area, producing 2 MMT of the crop so far. 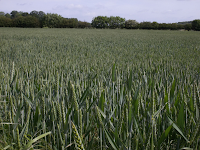 Yields are said to be averaging 3.81 MT/ha versus 3.77 MT/ha a year ago. Ukraine's harvest is also delayed, with 501.5k ha cut so far compared to 2.34 million ha this time last year. That's around 5% of the anticipated early grains area (which excludes corn), producing 1.53 MMT of mostly barley so far. There's a small amount of winter wheat in there (85.7k ha, or 1% of the planned area), yielding 3.2 MT/ha versus 2.9 MT/ha a year ago. Around 36% of the Ukraine 2015 winter barley crop has now been harvested, along with 7% of their winter OSR. The Rosario Grain Exchange estimated Argentine growers will plant the second smallest wheat area in 100 years this year. Plantings of 3.5 million ha would be the equivalent of an area around the size of the Netherlands. Low profitability and government intervention in wheat trade, restricting foreign sales with quotas and duties, is the reason behind the cut. Not that long ago Argentina was one of the world's leading exporters of wheat. Canada's wheat crop is in trouble from persistent dryness, which may cut production this year to 25 MMT or less, many are now saying. That would mean exports in 2015/16 would need to fall by 4 MMT at least, just to keep their stocks to usage ratio at what is already the tightest on record. The USDA currently forecasts production there at 29 MMT, although they are due to revise that figure in Friday's upcoming world supply and demand estimates. 06/07/15 -- Soycomplex: Beans closed with double digit losses, and much closer to session lows than session highs. Today was in fact the last ever daytime open outcry session in a Chicago history dating back almost as far as the US Civil War. We're all electronic from here on in. The overnight market opened badly following the Greek referendum result, which resulted in a general commodity "risk off" move, and in the case of beans failed to recover from that initial negative input. There was also talk that the long weekend in the US had a drier bias to areas already sodden by recent heavy rainfall, which lent a bit bearish. There's some talk of a drier, warmer, more summer-like weather scenario developing over the next couple of weeks. The dollar was up on the back of the Greek result, another negative today. Weekly export inspections came in at 197,441 MT, at the top end of trade expectations. AgRural said that the Brazilian grower is 77% sold on his 2014/15 soybean crop (versus 81% a year ago) and 17% sold on his not yet planted 2015/16 crop (3% a year ago). After the close the USDA reported the 2015 US soybean crop at 96% planted, in line with trade estimates, up only 2 points in a week and compared to 100% done a year ago and for the 5-year average. The remaining 4% is 3.4 million acres of unplanted beans using the USDA's June 30 acreage figure of 85.14 million acres. Missouri is only 73% complete versus 97% on average at this time, although 9 other states are also incomplete at levels ranging from 94-99% done. Soybean emergence was placed at 93%, up 4 points from a week ago, but still 4 points behind the 5-year average. They had 21% of the crop blooming, in line with normal. The all-important crop condition ratings held steady at 63% good to excellent (versus 72% a year ago), generally in line with trade ideas, although few if any were expecting an improvement so I guess that's as good as it was likely to get. 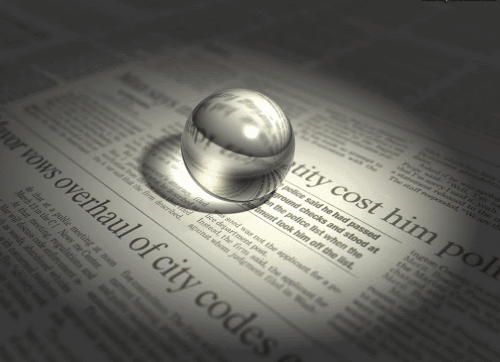 A Bloomberg survey estimated ratings dropping one point to 62% on average. The delayed weekly commitment of traders report showed managed money net long more than 67k lots as of last Tuesday night. They were long less than 2k lots the previous week. Jul 15 Soybeans closed at $10.33 3/4, down 11 1/2 cents; Nov 15 Soybeans closed at $10.14 3/4, down 15 1/2 cents; Jul 15 Soybean Meal closed at $354.40, down $3.00; Jul 15 Soybean Oil closed at 32.64, down 72 points. Corn: The corn market closed around a cent or two lower, although it had been running into double digit losses at one stage. All in all, corn did a better job off shaking off the initial overnight blues than soybeans, perhaps helped by wheat managing to turn around to trade in the green. Weekly export inspections were in line with trade ideas at 839,324 MT, even if they were down a bit on around 1.0-1.1 MMT where they have been running recently. The long weekend was said to have consisted of largely dry weather for the Midwest, featuring considerable sunshine hours and warming temperatures, a nice break from recent cool and wet conditions. Forecasts for the week ahead are mixed, still wet on the Southern Plains through into Missouri. East of the Mississippi valley, Midwest corn and soybeans would be less wet though, expecting 150% to 200% of normal rainfall, said Martell Crop Projections. There could be some heat this coming Friday to Saturday but it should be short lived. The USDA said after the close that corn crop conditions had improved 1 point in the good to excellent category, up from 68% a week ago to 69%, although still lagging 75% this time last year. A Bloomberg survey forecast ratings dropping one point to 67%, so this was a little surprise. Ohio is in the worst state, literally, at 45% good to excellent, followed by Indiana (48% G/E) and Missouri (51% G/E). The best conditions are in Pennsylvania (85% G/E), Minnesota (84% G/E), Wisconsin and Kentucky (both 83% G/E). "Now that acres have been pegged the market will be trading weather to a higher degree. Analysts continue to back off of lofty expectations for the crop size, but much of that has already been priced in at this point. Better than expected condition ratings could be enough to push prices lower over the session tomorrow," said Benson Quinn. In other news, APK Inform said that Ukraine seaports had exported 478.6 TMT of grains in the past week through to Sunday night, with corn accounting for 75% of that total. Spanish market analysts Agroinfomarket left their estimate for this year's corn crop there unchanged on previously at 10.806 MMT, up slightly on 10.741 MMT a year ago. They raised imports in 2015/16 a little, up to 6.25 MMT versus 6.15 MMT previously and 5.75 MMT in 2014/15. The weekly commitment of traders report shows a major turnaround for managed money in the week through to Tuesday night, where they flipped from a net short of almost 95k lots to a net long of over 70k contracts. Jul 15 Corn closed at $4.18 1/2, down 1 1/4 cents; Dec 15 Corn closed at $4.35, down 2 1/4 cents. Wheat: The wheat market closed higher, turning around initially much lower early trade nicely. Jul 15 Chicago wheat ended 2 3/4 cents higher, having traded as low as 18 1/2 cents easier at one stage. Latest forecasts call for wetness to continue on the Southern Plains, again disrupting the winter wheat harvest and potentially adding more quality/disease issues. "The 7-day rainfall forecast calls for strong showers this week again. A wide swath of heavy rainfall would extend from west Texas, Oklahoma and Kansas northeastward through Missouri. Five to 6 times the normal rainfall is predicted," said Martell Crop Projections. Meanwhile: "A heat wave in the West Coast is damaging wheat potential in Washington, the 3rd largest US winter wheat state. The entire western United States is in the throes of a heat wave, where a large, stable ridge of high pressure dominates," they added. The USDA cut winter wheat crop conditions one point to 40% good to excellent, saying that harvesting of this year's crop was 55% complete, up from only 38% done a week ago and catching up with the 5-year average of 59%. Drier conditions this past week have allowed the leading producing state of Kansas to advance from 48% harvested a week ago to 79% done as of Sunday night. The 5-year average is 83% harvested. Missouri lags the 5-year average by 20 points at 68% harvested. Ohio is only 13% complete against 37% normally, and Indiana has cut 39% of this year's crop against 60% on average. US spring wheat crop conditions were cut two points in the good to excellent category to 70%, now the same as a year ago. The USDA said that the crop is well advance, at 76% headed against 47% on average at this time. Canada got some rain this past weekend, but totals were scattered and less than half an inch. Weekly US export inspections were in line with what was expected at 368,818 MT. The strong US dollar remains a thorn in the side of these. The weekly commitment of traders report shows managed money having a change of heart on Chicago wheat, flipping from a net short of more than 50k lots to a new net long of 14k contracts. Elsewhere they are reports of lower wheat and barley production in Spain this year due to a dry May and extreme heat in June. Agroinfomarket cut their Spanish soft wheat production estimate from 5.483 MMT a month ago to 5.065 MMT, and down 9.4% compared to 5.590 MMT a year ago. Egypt said that, following recent tenders and a strong domestic buying campaign, it now has enough wheat bought to last it through into Jan 2016. Algeria bought 500 TMT of probably French wheat for August shipment over the weekend. Jul 15 CBOT Wheat closed at $5.88 1/2, up 2 3/4 cents; Jul 15 KCBT Wheat closed at $5.76 1/4, up 1/4 cent; Jul 15 MGEX Wheat closed at $6.18 3/4, up 12 1/2 cents. 06/07/15 -- The market reacted to news of the resounding Greek "no" to austerity vote by trading red across the board for much of the day, when European grains opened they following suit. Crude oil and equities also took the news badly, as the market developed a "risk off" look to start the week. By the close of European trade though, most grains were well off the lows of the day, and seemingly looking to get back to trading the fundamentals. At the finish Jul 15 London wheat was down GBP0.10/tonne to GBP120.15/tonne, Sep 15 Paris wheat managed a net gain of EUR0.25/tonne to EUR204.25/tonne, Aug 15 Paris corn was down EUR2.25/tonne to EUR191.505/tonne, whilst Aug 15 Paris rapeseed slumped EUR6.75/tonne to EUR387.50/tonne. The euro was predictably under pressure, with EU leaders set to meet today to discuss the implications of the vote. Greece's Economy Minister told the BBC that the ECB had to keep Greek banks alive for seven to 10 days so that negotiations could take place over the country's next move. Their banks are said to be running out of funds and on the verge of collapse. Some weekend rain relief was seen in parts of Europe, and more is expected for some areas later in the week too. The BBC however reported that temperatures hit 40.3 C in Germany yesterday, a record high for the month of July. There was talk that weekend rains in some of the soggiest parts on the US Midwest weren't quite as heavy as had been forecast. A drier and warmer outlook for the region added to the bearish tone to start the week. It wasn't all one way traffic though. In Spain, Asaja said that the dry May and searingly hot June could cut wheat and barley production this year to 33% below the 10-year average. Spanish analysts Agroinfomarket cut their forecast for the soft wheat crop there this year from 5.483 MMT a month ago to 5.065 MMT, a 9.4% decline on a year ago. They raised their Spanish soft wheat import forecast in 2015/16 from 3.7 MMT to 3.875 MMT, and cut ending stocks from 686 TMT to 578 TMT, a sharp 30% decline versus those at the end of 2014/15. Algeria said that they'd bought 500 TMT of soft milling wheat at prices said to be around $238/tonne C&F for new crop August shipment. APK Inform said that Ukraine seaports stepped up their export efforts last week, shipping out 478.6 TMT of grains, more than double the volume exported the previous week. Last week's shipments included 120.4 TMT of wheat and 358.2 TMT of corn. Top export home for Ukraine's grain last week was Italy, followed by Israel, Belgium and China. At home, the well regarded John Nix Pocketbook says that feed wheat is the most profitable crop to plant for the 2016 harvest, showing a potential gross margin of GBP658/ha. That lifts the grain into top spot from only fourth in 2015, leapfrogging marrowfat peas, blue peas and winter beans. 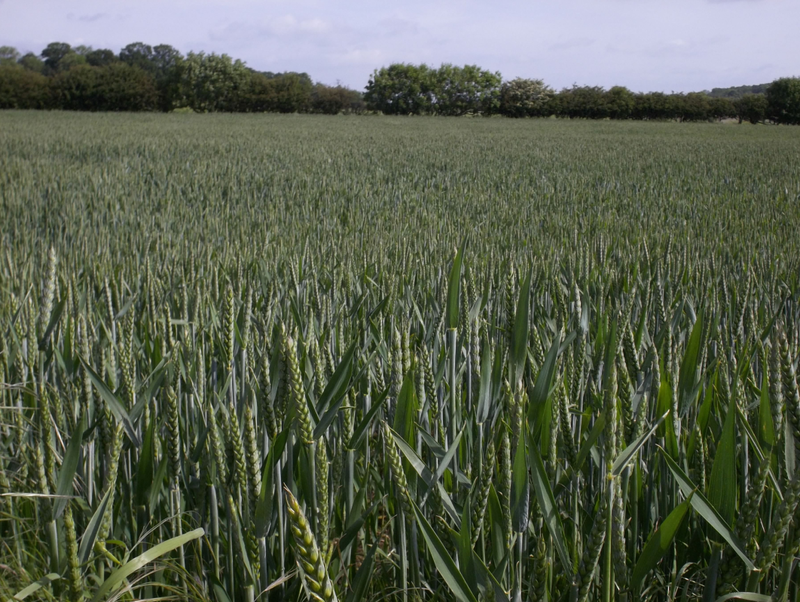 Up from fifth into second place for 2016 goes milling wheat, with a gross margin of £637/ha. Spring malting barley is in third next year at GBP524/ha, and rapeseed jumps from a lowly twelfth in 2015 to fourth, with a gross margin of £522/ha. Greek No Vote - Start Of Big Slide Or Buying Opportunity? 06/07/15 -- The overnight grains trade red across the board this morning, in what looks like a bit of knee-jerk reaction to the overwhelming Greek "no" vote over the weekend. Europe will no doubt open the same way too when trading begins here later this morning. Is this the start of a big slide, or a buying opportunity? 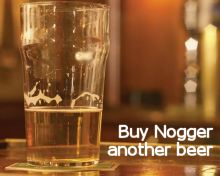 And if it's the latter what should you be buying? Doing a few sums over the weekend, I can tell you that the biggest price gainer last week was Paris corn, which jumped 11.5% as of Friday night's close compared with a week previously. Chicago corn was up 8.8% for the week, soymeal gained 5.2%, Paris wheat was up 4.6%, soybeans added 4.5%, London wheat put on 4.4% and Chicago wheat was up 4.0%. The relative straggler was rapeseed, up only 0.9% in Paris and with gains of 1.9% in Winnepeg. These figures are for the appropriate benchmark new crop month by the way, ie either Nov or Dec 15 depending on the commodity. Well, rapeseed lagged because that's already put in more gains than the others in recent weeks might be the first thought into your head. It was mine. So of course I checked back to confirm that I wasn't deluding myself, and the surprising result was that since the end of May, Paris rapeseed has actually performed the worst of all of the above commodities. It's up 8.3% versus the last day of May (and Winnepeg canola is up 14.6% incidentally). However even London wheat has seen larger gains than Paris rapeseed, up 12.6%. Marginally the biggest advance during this time has come from Chicago wheat, adding 20.6%, closely followed by Paris corn, up 20.5%. Now judging by various tweets and emails that have been popping into my inbox lately, the Canadian canola crop is in dire trouble, it will be lucky to make 10 MMT various people are telling me. The current official USDA estimate is 14.8 MMT, and production last year was 15.56 MMT. If these unofficial estimates are anything like right, then that's around 5 MMT less canola that the world's largest exporter will have to sell in 2015/16. Yet the USDA currently has them shipping out 8.2 MMT in the new season, little changed from 8.8 MMT in 2014/15. Meanwhile production in Europe is expected to be around 21-22 MMT, depending on who you believe versus 24.26 MMT a year ago, with demand up at 25 MMT. Ukraine's crop is expected to be lower, they will have some to export to Europe as they usually do, but the vast majority of that will be shipped out in the first quarter of the new season. Judged on recent efforts to try and buy old crop rapeseed here in late May and early June, there wasn't very much on offer at all, even when dangling a carrot of a GBP30-35/tonne premium over new crop prices. So it doesn't look like there's going to be a lot of carryover from last year here, a situation that I suspect could be replicated on the continent. Oil World's figure for this year's global rapeseed crop incidentally is 66 MMT, which is 2.5 MMT below the current USDA estimate and 3.2 MMT down on last year. ABARES peg Australian canola plantings at 2.35 million ha, down 400k ha, or 14%, on a year ago. They estimated Australia's 2015/16 canola exports at 2.18 MMT last month, down 11.3% from a year ago and the lowest since 2010/11. A mid-June Thompson Reuters crop tour of France recently concluded that rapeseed yields there could be down 10-15% in the normally most productive Centre region due to spring dryness. Agritel said last week that early French yields are "much lower than last year". Germany's crop is also expected to be down as much as 20% year-on-year.